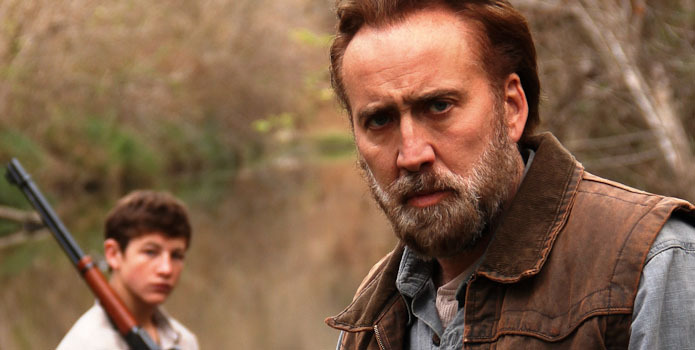 Director David Gordon Green returns to his roots with his latest film Joe. Based on Larry Brown’s novel of the same name, this is a film about a man looking for redemption, a kid who needs a role model and how an unlikely friendship is born. He has created a dark and richly layered film that explores the psychology of abuse, past regrets, difficult families, coming of age, and growing up poor in America’s Deep South. Joe Ransom (Nicholas Cage) is an ex-con that supervises a group of men that have been hired to clear trees and brush for a lumber company. This company does not want the trees that are growing on the land and has hired this group of men to poison them so they can clear the land for heartier pine. When Gary (Tye Sheridan) shows up looking for work after having just moved to the area with his deadbeat parents, Joe decides to give him a shot. Gary immediately proves he is a good worker and starts putting the time and effort into the job. He convinces Joe to give his alcoholic father Wade (Gary Poulter, a real-life homeless man cast for the movie but who has since died) a shot at work as well but this does not go well and Joe asks them not to come back. However, after witnessing Gary being mistreated by his father, Joe reconsiders his decision. Gary is immediately taken by Joe and recognizes in him a man that can be a role model and father to him, qualities he is not receiving at home. Over time, both Joe and Gary understand the mutually beneficial nature of their relationship and realize that the other is good for them. Joe, a reluctant, solitary man, begins to watch out for Gary and takes care of him where his own family cannot. However, seeing the change in Gary, his father tries to steal the money he’s been making at the job and is becoming increasingly aggressive. Joe doesn’t take kindly to this behaviour and vows to protect Gary. This is Joe’s chance for redemption for the past that continues to haunt him and when tensions burst, Joe ends it once and for all, hoping that he has given Gary the guidance he needs to take care of himself and to grow into a decent man. This is a fine return to form for Nicholas Cage. It can be difficult to anticipate what kind of performance you’re going to get from Cage in a film but in Joe, this has emerged as a comeback. This is the kind of work we all know he is capable of but so rarely see. Cage’s portrayal of Joe is subtle, dark, and textured. He is a complicated man with a complicated past. This type of project suits the actor and he would do well to continue this calibre of work. Sixteen-year-old Tye Sheridan, a notable standout in this film, is emerging to be young acting sensation. This is a kid that in just three feature films has proven himself to be incredibly wise beyond his years. He has the ability to find authenticity and emotional truths in every performance. He is able to stand up against some of the best actors working and it is exciting to watch him continue to grow. This is an actor to watch. The director has created here a fine companion piece to his resume of Southern Gothic tales (George Washington, All the Real Girls), the films that launched his career. This is a beautiful film, with a fine subtlety, and crafted with great skill. A well-written script grounds the film as David Gordon Green coaxes performances out of the actors that make this a joy to watch.